A predefined field contains a string of text you can add to any email message — text such as a slogan or other standard message. This can be for example company core values or contact info. This is not only a great personalization tool, but also a time saver. Now you don’t need to add manually the same piece of information to every message, the predefined field will do that for you. Use predefined fields in your messages in the format [[pre_X]] or [[pre X]], replacing “X” with the predefined field name. 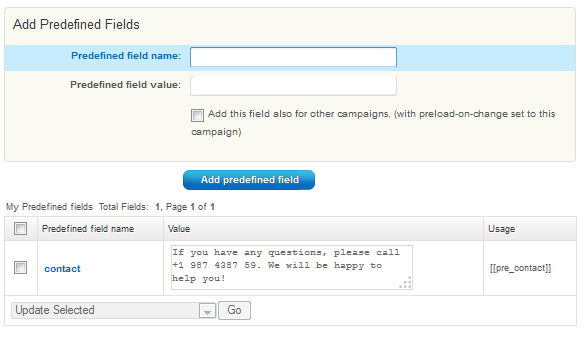 Please note that predefined fields are campaign specific so they deliver the same text for each contact in the same campaign. To add a predefined field, find the Your current campaign field in the upper right corner and click the down arrow to display the drop-down list. Click predefined fields at the bottom of the list and follow the instructions. Note: If you use the predefined field usage code in the campaign for which the field was not specified, the subscribers will see the blank field. To learn more about personalization click here.